Energy Crisis is happening mainly because of our dependance on fossil fuel. We have to know the causes, effects and solution to energy crisis. Energy crisis is one of the most talked topics in present times. People all over the world are somehow or other effected by the ongoing energy crisis. We all have to know the causes of energy crisis, its effect on our daily life and what is the solution to this problem. Because trade and finance all over the world are largely dependent on the oil market alone. Not only trade but also the overall political and social balance of every state highly depends on the availability of fuel, its price and its usage. Because most of the countries are still dependent on fossil fuel. Energy crisis represents the huge demand of fuel which is increasing day by day. But the sources of energy are limited, and the stock limitation is more. For this reason, we all are facing a crisis, a crisis or a fear of having no fuel to produce electricity and use our favorite gadgets. Non-renewable energy or Conventional energy. Renewable energy or Non-conventional energy. We all did not even used to care about this topic only a few years back. We all were happy with our conventional sources as the population on earth was low. In modern times gadgets are consuming so much power that every nation is now more or less concerned about their stock of energy. A secured and sustainable supply of energy is the key to prolongation and development of prosperous and modern society. Day by day energy consumption has been increased steadily with civilization development. In near future the energy consumption will be further increased to sustain the current human development. 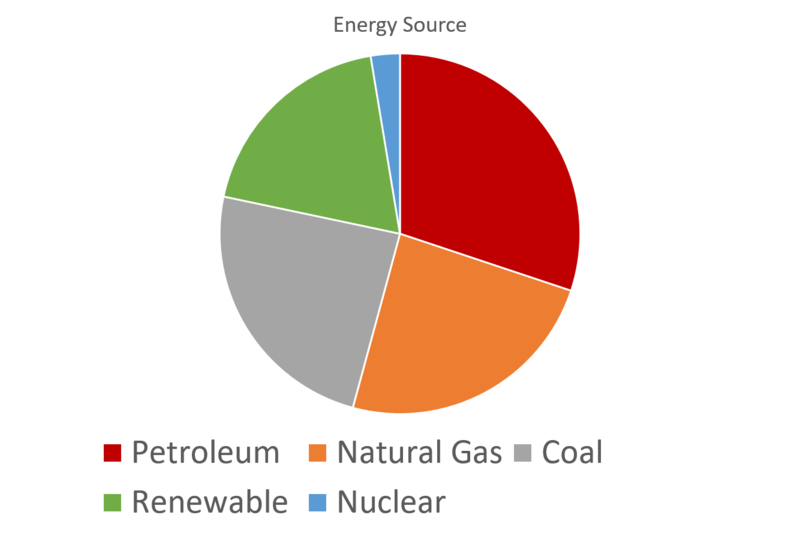 In 2016, worldwide energy consumption was 18 TW and 80% of that energy come from fossil fuel such as coal, oil and natural gas. The main issue of those sources is sustainability, especially with the continuous increase of the demand for energy. One quarter of the total energy used in the world was consumed in the US alone, and 85% of that energy depended on fossil fuels (coal, oil, and natural gas). The energy demands have kept on increasing very quickly and the consumption will increase even faster with the population growth and the development of underdeveloped regions. The predicted energy consumption for 2050 will amount to as much as 28-35 TW. After 1950 the CO2 emission due to fossil fuel has been increased rapidly. After 2000, the CO2 emission has crossed 10000 million tons. 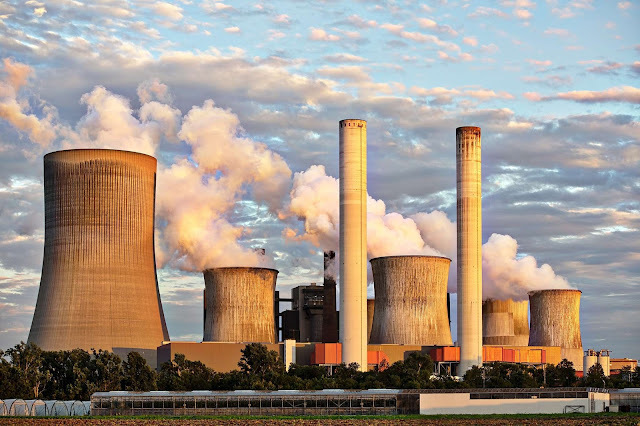 Thus, fossil fuel usage has a detrimental effect on environment such as greenhouse gas emission, air pollution, water and soil contamination and recent climate change. The enhanced use of fossil fuel increases the amount of CO2 emission which is responsible for global warming. A cumulative total of 420 billion tons of CO2 were emitted between 2000 and 2011. Moreover, fossil fuels are a finite source of energy. Oil and gas will run out in the near future. It took millions of years to produce, but finished in a single lifetime. For these reasons we have to think of alternative source of energy. Nuclear energy would not meet the current energy demand and is quite hazardous to the mankind too. The control of nuclear is very difficult, any disaster may arise at any time and disposal of nuclear product is another unsolved problem. Global Warming is one of the greatest threats towards our planet right now. Developed countries are trying to overlook the present scenario so that they can carry on their electric plants. However, this huge burn of fossil fuel at a regular basis is a direct threat to the Islands and sea side countries. By collecting huge amount of fossil fuels that we are creating empty spaces under the ground level of our planet which is increasing the probability of earthquakes and other natural calamities. Nowadays we all are highly dependent on electronic equipment around us. From morning to night, we use hundreds of gadgets without even thinking that how much electrical energy these devices are consuming. For this reason, every country is trying to secure the future of its energy sector for its citizens. Population is increasing rapidly and as a result the demand of power is increasing day by day. Another major reason behind energy crisis is misuse of power. General people who are not very considerate about the importance of power make misuse of it every now and then. In the third world countries, mismanagement in the energy sector is prominent. Energy crisis is the sequel of the inefficiency of the workers working in this sector as well as their inter-union rivalry. Renewable energy sources are yet to get popularity. Most of the developed countries which play the key role in producing electricity are not very much encouraged to use renewable energy sources to produce electricity. As the renewable energy sources are not as efficient as the conventional ones. Various terrorist organizations like Taleban, Al-quayda, ISIL, ISIL etc. try to capture mines so that they can use those fuels for their own weapons and they also sell those fuels to arrange fund for their notorious acts. We admit it or not, the middle-east countries are facing so many issues only because of their mines. All the developed countries whether it is USA or Russia are trying heart and soul to control as many middle-east countries as possible. So that they can ensure uninterrupted fuel supply to their electricity generating plants. Another problem occurring because of energy crisis is that each developed country as well as the developing ones also are trying to establish nuclear power plants. Whereas we all know the dangers of nuclear reactors. The first thing that we need is proper media coverage on the bad impacts of the fossil fuel and make people aware of the causes of energy crisis, its effect and what are the solutions of energy crisis. Then general people will start to understand that how vicious it would for all of them. After that we can make renewable energy sources acceptable to them. We should keep a close eye on the energy sector. Every year a huge amount of energy is lost only because of the lack of seriousness of the officials responsible for the supply of power. regular audit and manipulation should be arranged by the governments of every countries. Green economy should be encouraged by every state so that its financiers stop thinking about making revenue by tormenting the environment. Government should take proper steps to permit proper budget to develop renewable energy sector. Every country should establish an autonomous committee to research and decide which renewable energy source would be appropriate for them. And then according to the decision made by the committee renewable energy should be produced. “What do we plant when we plant a tree? Global temperature increases on world scale have been a matter of concern and concern, on the other hand people are troubled by the rise in petroleum products. Within the country, the Prime Minister is presenting nuclear energy as an inevitable alternative to meet the energy needs. As the cumulative reserves of coal and petroleum will decrease, the energy crisis will be deepened. At present, about 70% of the electricity in India comes from coal based thermal power plants. Approximately 20% of the electricity is obtained from big hydro projects. But since the movement against big dams has started on the question of displacement, these projects have not been practicable since then. The life of a large dam is about 40 years. That is, the two biggest sources of power generation in India are coming to an end. Then where will our electricity come from? At present, only 3% of the electricity is obtained from nuclear power in India. When the nuclear energy program was started here, its parent Homi Bhabha had predicted that by 1987, we would make 20-25,000 MW of electricity from this program. Obviously this program is not very successful. If the program of nuclear bomb was not connected with it then it would have been possible to close the program till now. The nuclear energy program is also facing difficulties on the scale of the world. The main difficulty in this program is that scientists have no solution to safeguard the radioactive waste from the nuclear power plants. The waste from 104 nuclear power houses in the US is currently being kept in drums in the plant premises. The local public made such a huge opposition to the plan to bury the waste by making tunnels in the Ucca Hills of the state of Nevada that the US government has abandoned this idea at the moment. This is the reason why there is no plan to set up a new nuclear power plant in the USA in 35 years. New nuclear power has ceased to be built in England, Canada and Germany over the last two-three decades. France, which today fulfills its 75% power requirement with nuclear energy, is only going to introduce a new factory in the coming days. In the coming two to three decades, France, which is presented as a successful example in the use of atomic energy, will fall in the percentage of contribution of nuclear energy in the generation of electricity. Japan is also looking for new sources of energy, especially transparent recovery resources. A 2006 study by the Planning Commission of India stating that if India's nuclear deal is finally approved by crossing all obstacles and by 2020, we also make 40,000 megawatts of power, even then it will be able to generate electricity from India's total electricity Not to exceed 9% of the production Given the quality of the nuclear energy program so far, the actual production will probably be up to 5-7%. That is, we will have to rely on other sources for our 91-95% power. Thus, the Prime Minister says that nuclear energy is the only alternative in front of us to maintain India's 8-10% growth rate, it is unrealistic. India has made remarkable progress in the field of wind energy over the last ten years. In the world, we have become the fourth largest country in terms of power generation from wind power. While the Department of Atomic Energy has been fully funded by the government for 60 years, in just ten years without the help of wind power, 5% electricity generation capacity in India has been established. That is, the power generation capacity of wind power has more than nuclear power. Wind power in India is likely to generate 45,000 MW power. According to the Energy Engineering Administration, a US-based organization, about two-thirds of those plants will be found in electricity production in the world in the coming two to three decades. There can be two major sources of gas for India- Burma and Iran. Because the military ruler of Burma did not get angry, the Indian government did not openly support Aung San Sookie's democracy movement. But Burma has decided to sell its gas to China. In this way, Iran's gas which could come from the proposed Iran-Pakistan-India gas pipeline has become even more important to us. This is an agreement which is in the interest of the three countries, and between India and Pakistan, there is going to be such a thing after a long time, in which the interests of both of them are linked. This agreement will be more democratic and equitable than the Indo-US nuclear deal, and will be beneficial for the purpose of regional stability and peace. For the next two to three decades, India will have to base its power generation on good quality coal and gas only. Even after coal, maybe carbon emissions from burning coal will be set to limit the use of coal. Carbon emissions in the use of gas is less than coal. For this, gas based technology will be more prevalent in the coming days. But after three decades, we have to make the renewable resources the mainstay of our energy needs. In addition to wind, solar, biogas and micro hydro electricity will be the major ones. The way Japan and the European Union have decided that by 2050 they will create a low carbon emissions society, they should be ideal for us. America is not ready to impose any restrictions on this type of situation. Therefore, we will make a big mistake by considering America as an ideal. A responsible country should play its role in keeping ecological balance and keeping the environment clean. The real energy challenge in front of India is how the majority of Indian nationals have access to electricity from villages and villages. In order to meet the needs of villages of India, need cheap, micro / small, decentralized and local energy options. Renewable energy sources can also meet these needs better. We should also look at the fact that whenever it comes to meeting the energy requirements, we should not just think about the generation of electricity. Power without electricity can also be met. For example, the energy of solar energy can be cooked directly from the heat. Our objective should be that we develop alternatives to the needs of the society's energy in the wider public and environmental interest, with complete understanding and responsiveness from equitable misconceptions.